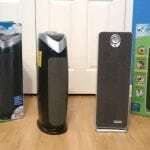 Home » Product review » GermGuardian AC5250PT Air Purifier Hands-On Review & Test – What’s It Really Like? To make matters more complicated, it’s hard to make a buying decision and get the right air purifier you need without all the details. And how can you tell if it’s worth your hard-earned money? 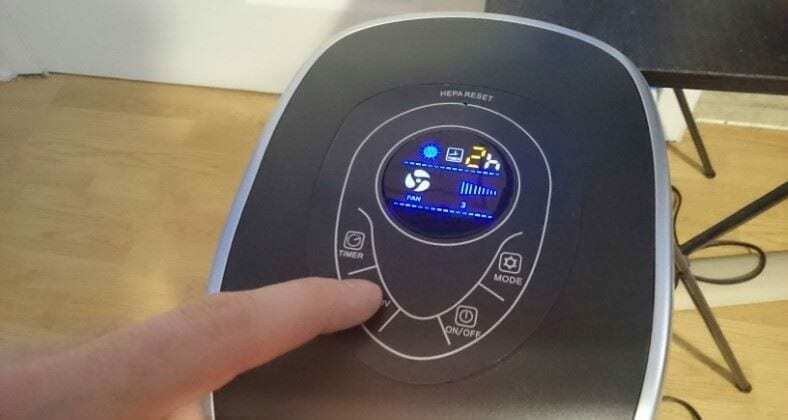 To help, in my hands-on detailed review of the GermGuardian AC5250PT I’ll tell you all this and more. I’ll share all the finer details you can only get from hands-on testing and use. You’ll find my detailed review summary at the end, too! 9. Does the AC5250PT produce ozone? At about 28″ (71 cm) in height, the AC5250PT is a version of the AC5000E and is related to the super-popular AC4825. It’s one of the larger purifiers in the GermGuardian AC series line, which are some of the best-selling air purifiers in the world! Just like its siblings it features a similar design both in style and air purification quality. The GermGuardian AC series of purifiers includes a large range of models. Based on their good value and simple, reliable designs the ones pictured above are some of the most popular. As they stand taller by design they’re sometimes called “tower” purifiers. The AC4825 is a 22″ (~56 cm) tall purifier for medium rooms up to 167 square feet in size. Its twin, the AC4900CA, is a somewhat lesser known model that features the same internal parts & operation in a different cosmetic package. The AC5000E and AC5250PT, however, are for medium to larger rooms up to 180 sq. ft. and are a bit taller at about 28″ (71 cm) in height. Unlike the other models, however, the AC5250PT features electronic controls. I’ll cover those in more detail later. Unboxing my AC5250PT for testing. Inside the box it’s neatly packed and held in placed by recycled cardboard. Also included is the owner’s manual and a Guardian Technologies product brochure. Removing it was easy and there’s no hassle. 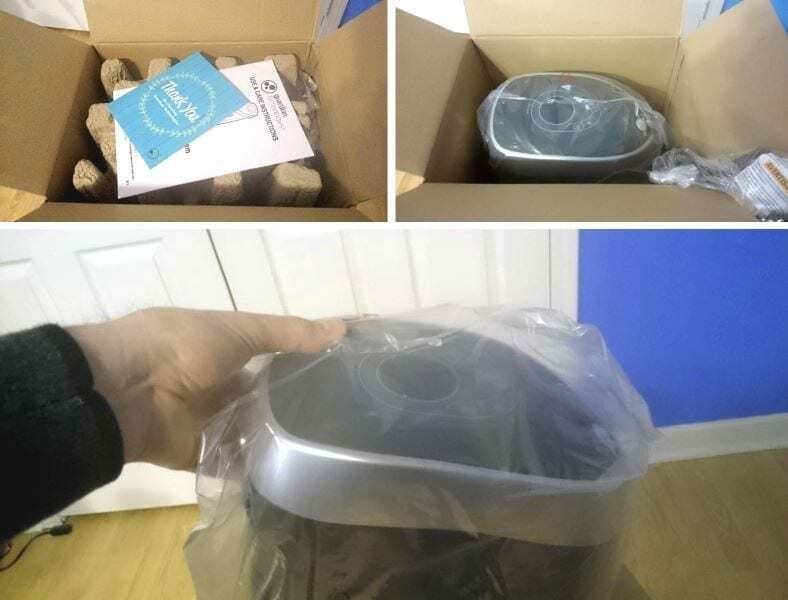 Just like all the other GermGuardian air purifiers I’ve owned and tested, the AC5250PT arrived neatly packaged and well-protected. Additionally, in this case for the first time I also found a nice little product brochure titled “Thank You” which was a nice touch. Inside was not just the contact email for the company but a real phone number for when you have concerns. Additionally, there a notice encouraging you to register your product for its warranty. The reward is a $10 credit towards your next buy. Inside the package I found a nice little “Thank You” fold-out brochure showing some more of the company’s great products. Humidifiers, aromatherapy, and other types of helpful items are shown. Customer support information is there, too, as well as a buying credit offer if you register for your warranty. Nice! Picking up the AC5250PT is easy – just like its other siblings, there’s a nice little carrying handle area provided on the top rear. I picked my purifier up and got to work testing it out! As I always like to do, after unboxing my new purifier I gave it a close-up look to check build quality and for defects. I’m happy to report the quality is good (just like other products from the same company) and it’s well-made. There’s no substitute for getting your hands on a product to check the build quality up close. So as I always do as a rule, I went over the AC5250PT to check build quality and for any potential defects. I’m happy to say it’s well-made and looks great! Body sections are tight without any sloppy gaps (that would be a clue to poor quality). The whole thing appears well put together and feels solid in your hands. Like the other models in the same family, the body has a satin black finish with contrasting satin silver trim color on top. The control panel is well-made too. Everything lines up correctly and looks great. Shown: Testing the electronic touch controls on the AC5250PT. They’re easy to use and simple to understand. To change settings, simply push that feature to rotate through the various settings then back to default (off) setting for each. A clear, well-designed digital display shows the settings at a glance. To switch fan speeds, turn the unit on/off. or setting the auto-off timer, simply keeping pushing a button as needed. Each touch of a button will cause it to rotate through the different settings and then return to the first setting. As there are 5 fan speeds you’ll simply rotate through them as you prefer. By default the unit powers on to setting 5 (high). Position 1, low, is a very low noise setting. When touched, each button makes a “beep” sound which I found ok and not too loud or annoying. However, if you prefer you can switch off the control beeping. Beeping will reset when the unit is unplugged. Also you can switch beeping back on by doing the same process again. That’s a nice detail I appreciate. The timer is a feature I love and that’s super convenient! Just set it for 1 to 8 hours and walk away – the purifier will shut itself off automatically after the selected time. One thing I’ve really been missing on many GermGuardian purifiers is the lack of an auto-off timer. The great news is the AC5250PT allows you to select 1-8 hour settings before it shuts off automatically. It’s a great option to let the unit run while you’re out during the day. It’s easy to switch if off again, too: just push the timer button again until the hour setting disappears. It’s then back in manual operation mode. 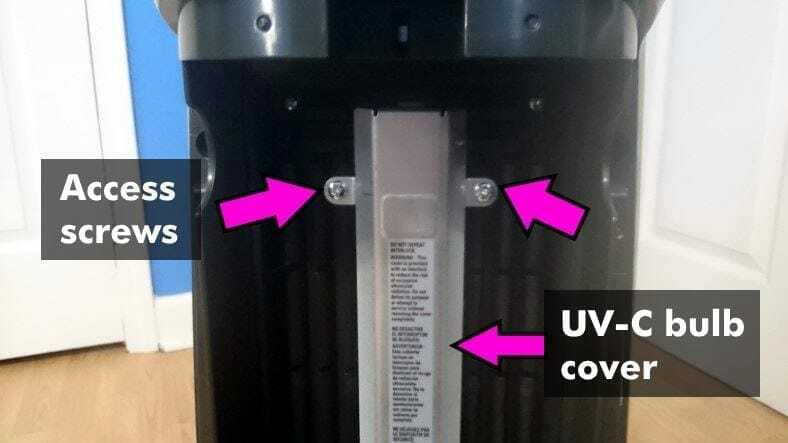 Likewise, the UV-C feature is extremely easy to use, too. Just push the UV-C button to switch the feature on or off. You’ll know it’s on as the trim ring on the top of the purifier will have a soft blue glow. Unfortunately, there is one complaint I have. There’s no memory feature which means once the unit is switched off then back off again you’ll have to adjust the settings as you did earlier. It won’t automatically recall the last used settings when turn on again. While not a deal-breaker, it’s an annoying thing and I consider it a poor design decision since there’s no reason it couldn’t be added. The AC5250PT’s CADR ratings are shown here. AHAM is an organization that verifies the testing results of home appliances & carry out lab testing for appliance manufacturers. This is voluntary as it’s not required by law. At nearly 28″ in height, it’s definitely not small! The name “tower” refers to the tall, slender design of many air purifiers sold today. One reason for this design is due to having more fans to give more air flow. The fans are placed in a vertical way to help reduce the amount of space the purifier needs on your floor. It’s important to make sure you have enough room before buying. I recommend leaving about 2 feet or more in front and behind the purifier as it needs space to circulate the air without interference. Obviously as it’s tall it can be tipped over, but in my experience it’s not too easy to tip over. As it weighs just over 10 lbs it’s pretty steady on a flat floor. It’s a nice touch I didn’t notice at first but after moving it around to find the ideal place in my home, I found it handy. Pictured: I measured power use (in Watts) for all 6 recordings (5 speeds, plus the off setting). I recorded power meter readings both with and without the UV-C feature switched on. 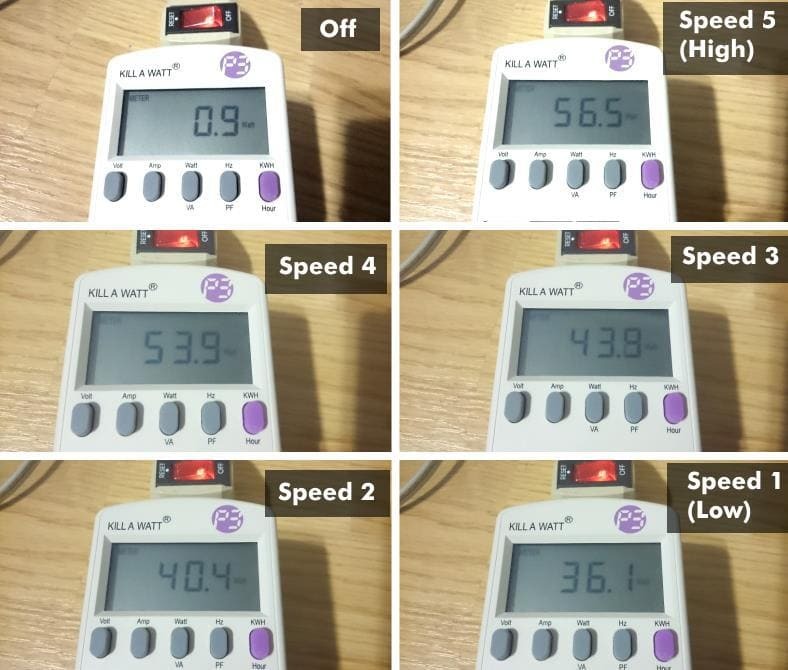 My measurements are similar from speed 4 and down to the smaller AC4825’s power use, which is good! How many watts does the AC5250PT use? Unfortunately the manufacturer doesn’t give power consumption specs. However, I’m already very familiar with other models like the AC4825 which use about 50 watts on the top speed setting. Rather than guess, I measured power use in Watts for all speed settings with and without the UV-C feature switched on. Note that the UV-C option uses about 8W of power. Ultimately, I found it doesn’t consume much more than a medium room purifier. In fact it’s only when it’s on the level 5 setting (maximum speed, the default setting) that it draws about 3W more – still a relatively low amount altogether. At setting 4 and below it’s almost exactly the same power use as the medium room AC4825 or AC4900CA models I’ve tested (around 50W). I have an unfortunate major dust problem at home! I’ve had great success getting relief with the GermGuardian purifiers as you can see above from my dirty filter. The AC5250PT was no different – and in fact even better than smaller models. 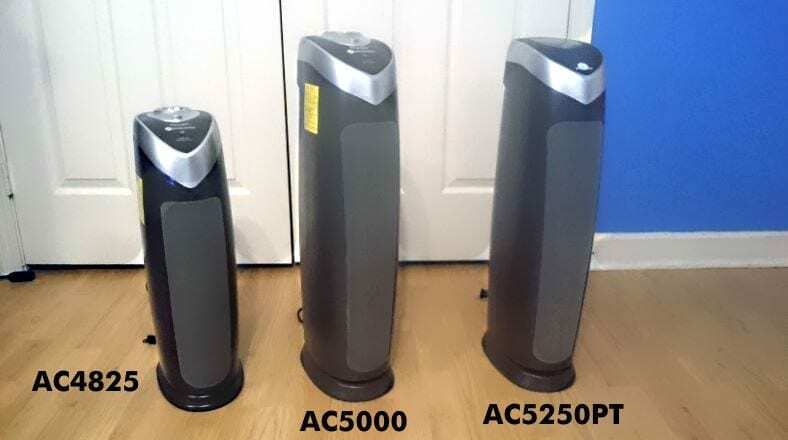 Just like my other purifiers from the same company, the AC5250PT did a great job of filtering the air during testing and everyday use. As I have a major dust problem it’s easy to know how well a product is working. The purifier did a great job and I don’t have any complaints aside from a lack of a “Turbo” super high-speed mode offered by some Honeywell models. It works well and I especially enjoyed coming home to fresh air after a day at work. Additionally, when didn’t want to use it I just set the timer for about 8 hours and left it alone. It’s also great for removing allergens, hair, and the general items like pet dander and odors. I tested the unit with several odor sources and it worked well! I noticed it only took a short time before odors trapped indoors were gone or really much less noticeable than before. The AC5000 & AC5250PT are good for large rooms up to about 180 square feet in size. That being said, there’s absolutely no reason it can’t be used in a small room! 180 square feet is a room about 12 x 15 ft in size. Bear in mind that this is an approximate size used – it doesn’t have to be used in a room exactly that size. When used in larger rooms the amount of time required to fully cycle and clean the air increases, of course. In my experience the term “large room” is accurate and the AC5250PT works well for those. Tip: If you have a large main room or larger rooms you can also use more than 1 AC5250PT to get extra coverage. 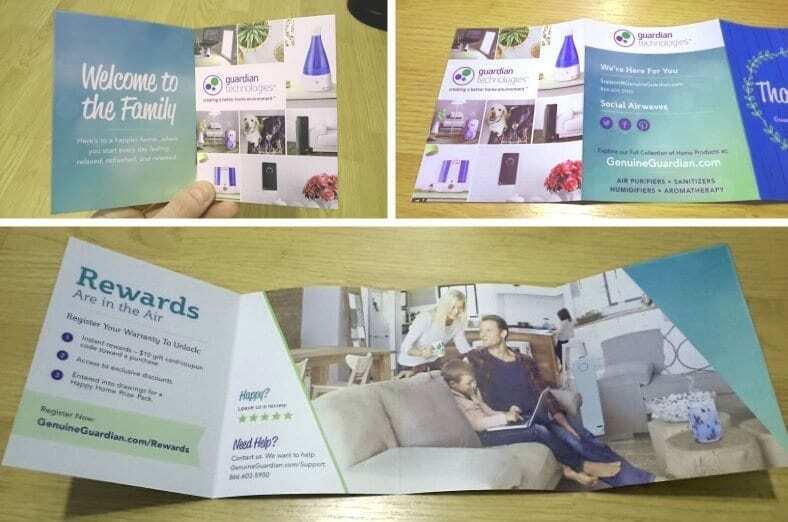 Using multiple purifiers for more room coverage is a great way to save a bit of money or for convenience as you can place them at different locations. The AC5250PT’s HEPA filter section (shown here) is made up of a folded, dense fiber material. A second section, the pre-filter/activated carbon filter, is responsible for trapping larger particles as well as odors and volatile organic compounds (VOCs) in the air. It’s capable of excellent filtering ability and works well. 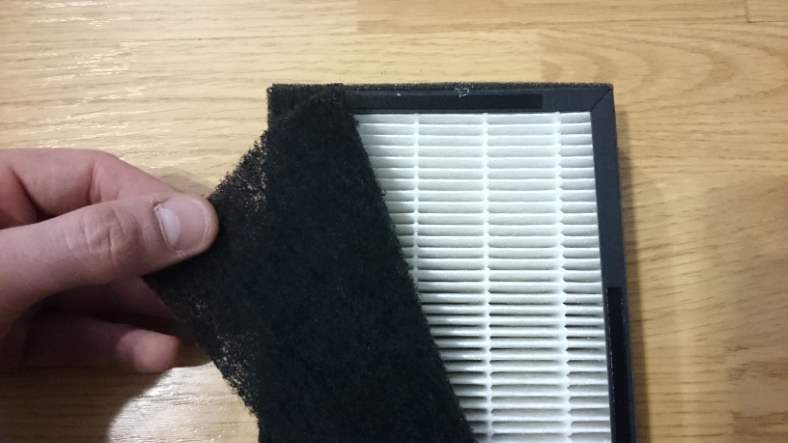 The filter can capture nearly 100% of all particulates in its airflow down to 0.3 microns in size! Essentially, this is an air cleaning system as the filter assembly is made of 2 main parts: the pre-filter/activated carbon filter and an extra 2nd section, the HEPA filter. 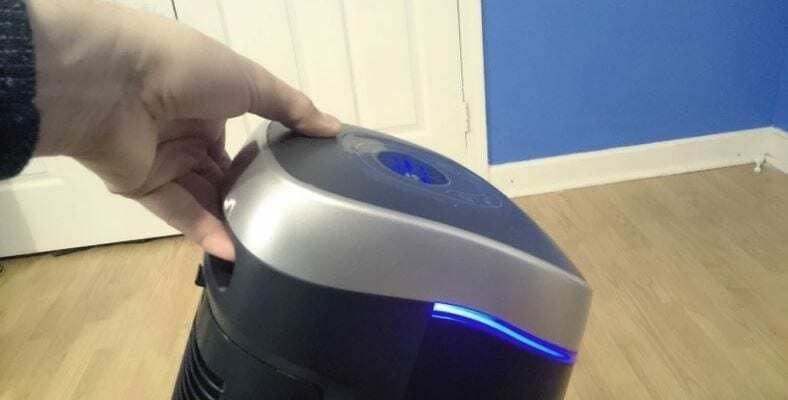 The AC5250PT, like several other GermGuardian air purifier models, features a bulb and titanium-oxide germ killing feature which radiates onto germs passing through it. This renders them inactive by affecting their molecular and protein structures. When activated, you’ll see the small, thin trim on the base of the silver decorative top glows from the UV bulb inside. Don’t worry – you’re not in any danger from exposure to ultraviolet light. It’s safely contained inside. It’s kind of cool how the feature adds a styling touch to the unit and gives it a lovely blue light accent. One complaint I have, however, is that once it’s in use, switching the purifier off then on again won’t re-activate the feature. You’ll have to do so manually, as there’s no memory feature (unlike some competitors) to restore the setting upon then next power up. Like lack of a fan speed setting memory, it’s not a real problem, but an annoyance to know about. Does the AC5250PT produce ozone? As I explained in this post, filter-based purifiers don’t add anything unhealthy to the air. They don’t produce emissions, gases, or by-products. 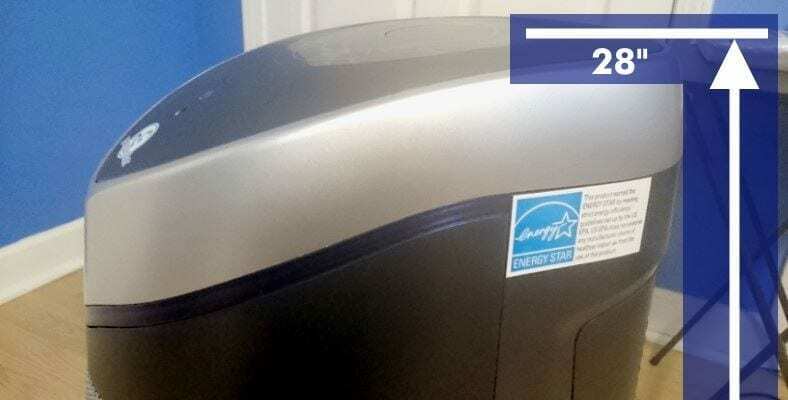 The AC5250PT is perfectly safe and healthy as it does not produce unsafe ozone levels. The purifier features a helpful way of indicating when it’s time to check and possibly replace the filters. After about 6 months of use, the filter replacement light will flash continuously and you’ll hear a beeping sound for 30 seconds. If your filter has had very light use and isn’t heavily used, you can reset the indicator by holding use a fine tip like on a pin in the reset button switch hole on top of the control panel. 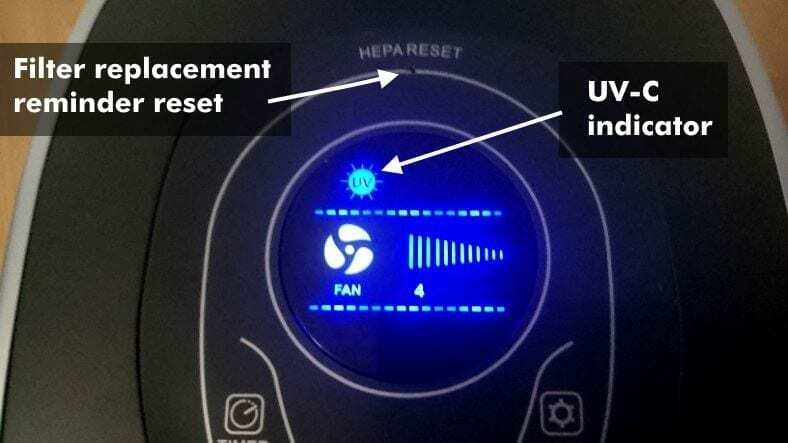 In the case of replacement for the UV-C feature’s bulb, the UV indicator on the display will blink. The AC5250PT ships with the FLT5250 filter installed. 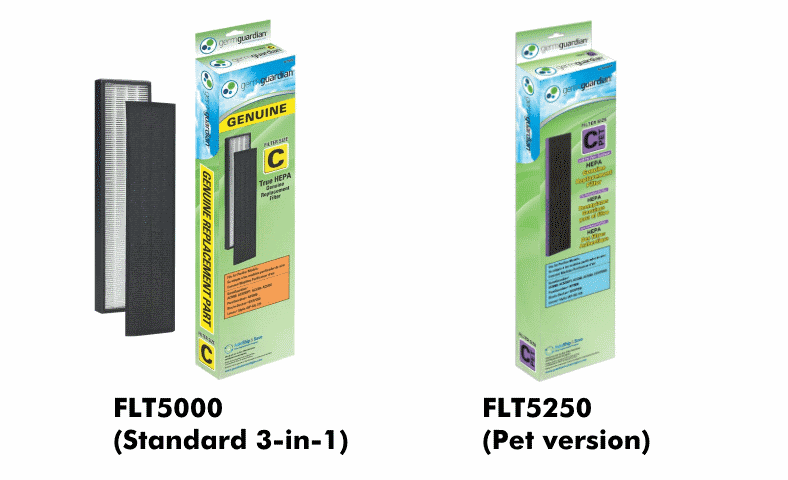 It’s a pet version of the standard FLT5000 HEPA/carbon filter. It features a special anti-microbial coating. However, FLT5000 filters can be used as well with no problem. Filter life is around 6-8 months depending upon use and the level of particulates in the air where it’s used. As an example, consider that cigarette produces a significant amount of particles as well as odors that will become trapped in both filter sections. You can definitely expect a limited filter life in that case. For lighter you’ll extend the filter’s life. Replacement periods will be fewer and further in between. If you’ve got a lot of pets at home and they produce a great deal of odors, dander, and other unpleasant things the filter’s life will decrease. Replacement filters cost around $30 or so for the genuine GermGuardian set. However, 3rd party replacements are available for a few dollars less if you don’t mind not using the pet version. If you’re trying to keep costs down those are great options. The great news is that you can replace the prefilters separately! There’s no need to pay for the extra HEPA filter if yours isn’t fully used up yet. Prefilters are typically available in packs of 2 or 4 and sell for about $15-$25. 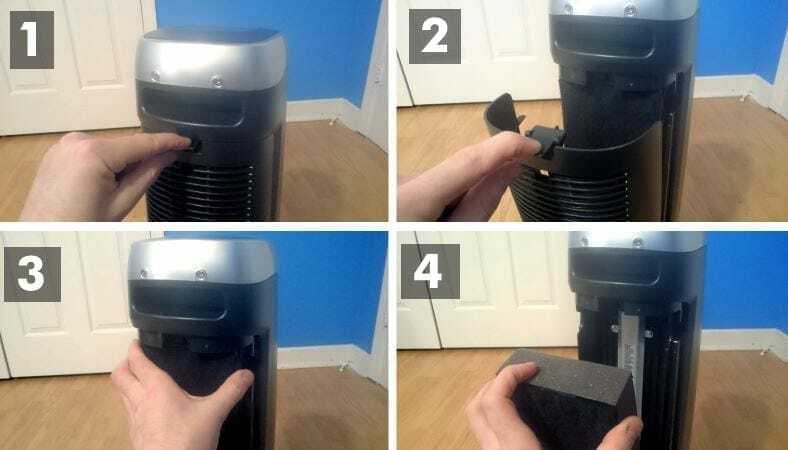 Replacing the filter assembly is easy – just remove the back cover (1, 2) and then pull the filter out and down (3,4). It only takes few minutes to do. 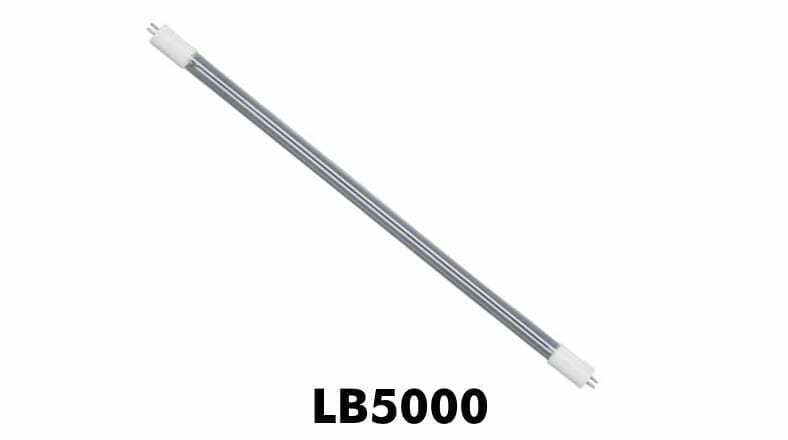 The AC5250PT uses the standard bulb used in the AC5000, which is the LB5000. Replacement will cost near $25, but expected life is rated at about 12 months. Filter replacement is done by removing the protective UV bulb’s metal cover. The cover shields you and others from ultraviolet let as well as protecting it. After removing the filter, you’ll need to remove 4 screws holding it in place. You can then pull out the bulb. Replacing the UV bulb, should it be needed, takes about 15-20 minutes or so depending upon how comfortable you are with a screwdriver. After removing the filter you’ll see the metal bulb shield which has 4 screws: 2 on top and 2 on the bottom. Removing these with a Phillips head screwdriver will give access to the bulb. Once that’s done, it’s just a matter of twisting it and pulling it out. It’s pretty easy to do if you’re comfortable with small tasks like that. Just as I’ve come to expect the owner’s manual was again clear, detailed, and easy to read. All basic & important information is included. There’s also information about how to contact the company as well as replacement part numbers. I always check owner’s manuals when reviewing products because I know how frustrating it can be when information is lacking or confusing. 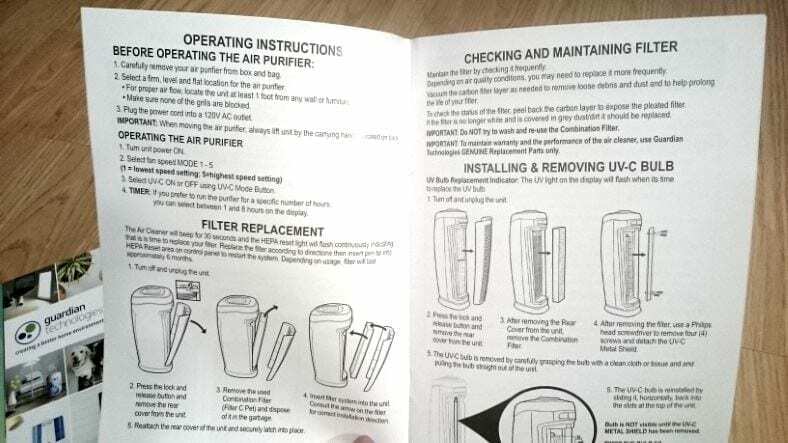 After unpacking my purifier I flipped through the manual. It’s clear, well-written, and gets right to the point. It’s also printed in English, French, and Spanish. Honestly, the purifier is so darn easy to use it’s really not necessary, although if you’re a first-time buyer I’d recommending brushing up on product use tips. 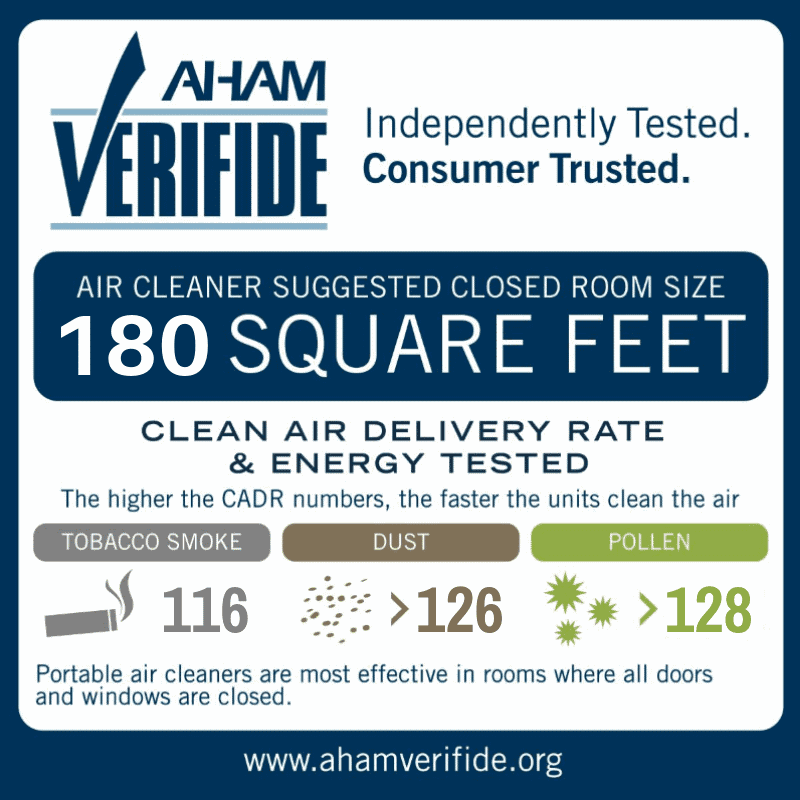 However, one thing did annoy me: the Clean Air Delivery Rate (CADR) ratings aren’t inside as well as a few other specs missing. They’re available at the manufacturer’s website, however. I’m not sure why they’re not included in the manual. I prefer to personally measure, record, and verify noise levels of the products I test. 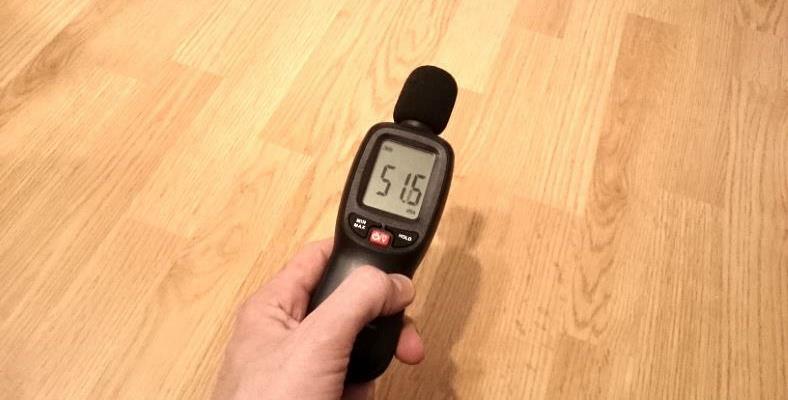 I used my sound level meter get a consistent measurement you’ll find in typical real-world use. The best thing to do is get real measurements to back up my observations with data. 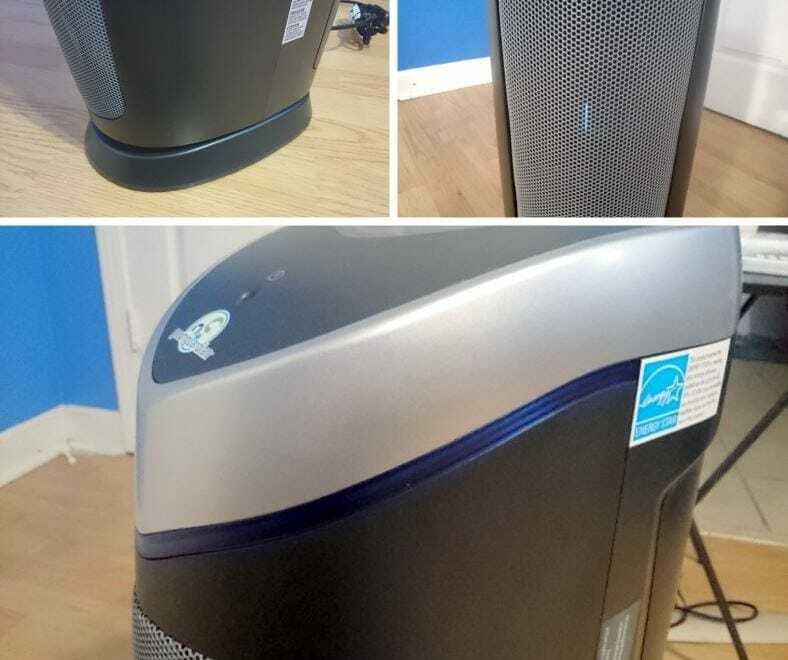 Overall I have to say it’s a quiet purifier, aside from speeds 5 & 4, which are moderately noise but not too loud. On settings 2 and especially 1, I could barely even hear it at all. Set to one of the lower settings it’s nearly impossible to hear while the TV, radio, or other sounds are playing. Overall I’d say it’s a pretty quiet purifier and good for those appreciate low-noise appliances. At night the purifier has a bit of a glow (especially with the UV-C featured turn on as shown above). However, in my experience it’s not too bright. It won’t light up the entire room. If you’re sensitive to light when sleeping you’ll likely want to turn the UV-C feature off. Unfortunately unlike some competitors there’s no way to turn off the display’s backlight or that for the power light either. However, in practice, I didn’t find them to be a bother at night. Then again, as the human eye is especially sensitive to blue light, I did switch off the UV-C feature at bed time. The power LED has a soft green glow that’s visible in the dark but not very bright. The UV-C trim ring adds an effect like a night light. As the human eye is more sensitive to blue colors, you may want to leave it switched off when sleeping if you’re sensitive to light. I know I am, so I used it without the feature on at night. Optionally you can always face it in a different direction to avoid the light as well. As they look so similar it’s easy to see how it can be confusing between these 3 models. There are a few differences to know, with the PT version being a slightly enhanced version of the AC5000 model. There are few differences to know when shopping. Namely, it’s a matter of room size coverage. 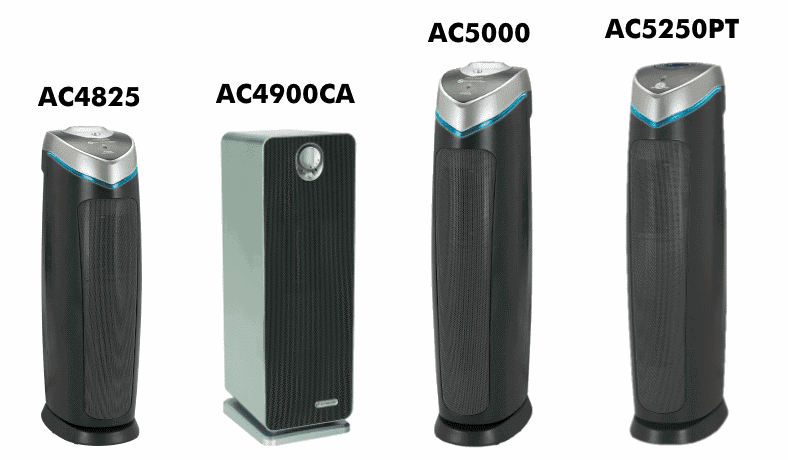 While the AC4825 is a small to medium room purifier and features a recommended coverage of 167 square feet, the AC5000 is basically a larger version of it. The AC5000 and AC5250PT are rated up to 180 square feet but have more fan power their smaller sibling doesn’t. It too features a 5 year limited warranty, so you’re no losing anything there. The great thing I found, though, is that it’s only a bit more money than its twin the AC5000. For the $20-$25 extra dollars or so I think it’s well worth the money! As a happy AC5250PT I can honestly say I like it! It’s a great purifier that allows me to finally enjoy the main thing I was missing from the other models I own & have tested: electronic features. While it is sold as a “pet” purifier, in truth it’s a good all-around value-priced air purifier for any reason you need one. Don’t let the pet description fool you. This one’s the same – and better – than its siblings that have already proven themselves as great air cleaning products you’ll enjoy. Despite a few minor complaints, it’s a winner and still a good value! Be sure to head over and see why thousands of others made it one of the best selling purifiers at Amazon. 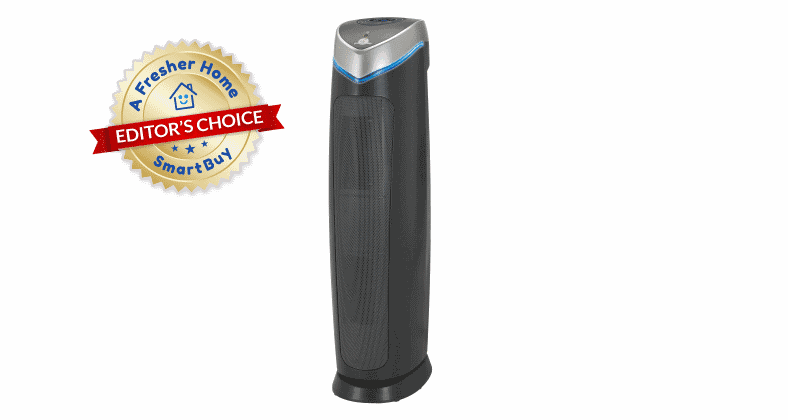 Despite a few annoyances, it's a solid, value-priced purifier that lives up to its popularity. 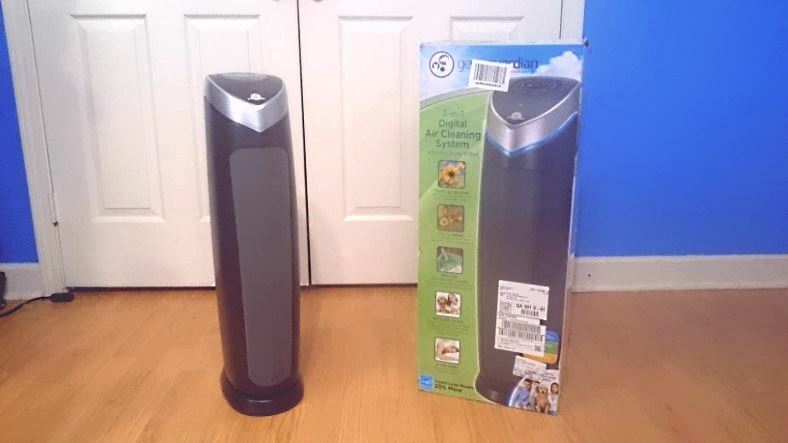 A great all-purpose air purifier despite the "pet" name. As an owner & tester of multiple GermGuardian products I can happily say it lives up to my expectations. Just like other models, it's a value-priced purifier that's simple to use, reliable, and features very good filtering ability. The AC5250PT takes the simple design of its twin AC5000 and adds electronic controls along with a convenient auto-off timer. Although rated for pets, it's really the same design with an enhanced filter type (anti-microbial). Unfortunately, no memory feature is designed in so it won't remember your last settings when turned on. It's quiet, well-made, and hassle-free to use. Maintenance costs are reasonable and lower-cost filters can be found. A good choice, and worth the few extra dollar vs its lesser sibling. Highly recommended!